Price per day & person, does not include dives during trip. Hint: You can use dives from our discounted Boat Dive Packages Air during our multi-day trips! 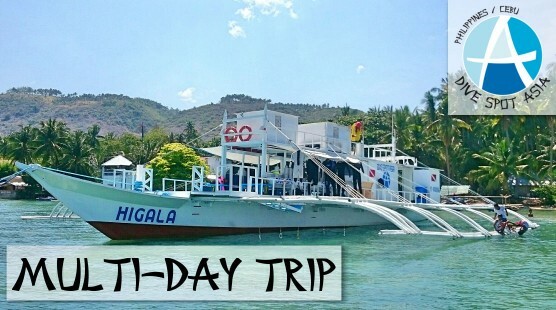 Our Multi-Day Trips (5,500 ₱ per day & person) consist of up to six dives (not included in trip price) with a maximum dive time of 60 minutes per dive. These safaris will be done with our big banca “Higala”. Included is a snack served with softdrinks, coffee, tea and drinking water. An expert guide will be onboard during these trips. Additional nights and meals ordered in other resorts during the trips are not included in the price. Please also visit our Day Trips Information Page to learn more about our Multi-Day Trips and the different destinations. Please choose which dive offer you would like to combine with the trip. For Prices please refer to our Price List (right-click and choose "open in new tab" if link doesn't work).